London Coliseum audiences who went to Offenbach’s Tales of Hoffmann recently saw one version of Coppélia in the first act of that opera. It involves a young man who falls for a mechanical doll built by Dr. Coppélius, based on an 1816 tale by E.T.A. Hoffmann himself. This ballet was created in Paris in 1870 less than two months before the Franco-Prussian war started, and during the siege of Paris later that year the ballerina who created the main role, Swanilda died of smallpox on her seventeenth birthday. But the ballet with its glorious music by Delibes survived, and in 1884 Petipa re-choreographed it in St. Petersburg. Most later versions are based on his, and this is Peter Wright’s third. With glorious sets and costumes by Peter Farmer, lit by Peter Teigen, it is a sight not to be missed. The mime element is strong and very well performed by the company. The ear of corn scene — if it rattles, his love is true — is well portrayed by Swanilda and her friends, and in this version her fiancé Franz is strongly portrayed as a ladies man (in the original ballet it was a travesti role). Chi Cao performed superbly as Franz, and his solos in Act III were terrific — those wonderful beats, particularly on the cabrioles, were a sight not to be missed. Nao Sakuma also exhibited fine technique as Swanilda, and suitable playfulness in the Act II scene in Coppelius’s workshop. Among her six friends, Maureya Lebowitz was in a class of her own — surely a dancer destined for principal roles. The ensemble dancing was very good, and in Act I this ballet was the first to include the Hungarian Czárdás, which should be more stylishly portrayed, particularly in the slow courtly first section. Angela Paul, who also danced Dawn in Act III did well here, but in general the frisson of pride was missing. The interactions of the characters in Act I, the apparent coming to life of the doll in Act II, and the dance of the hours in Act III were all charming, and as the evening ended with a glorious pas-de-deux by Chi Cao and Nao Sakuma, the applause rang forth. The conducting of Delibes’ music by Koen Kessels was wonderful, from the start of the prelude to the end of the ballet, and the Birmingham Royal Ballet’s visits to London are always a great pleasure. Further performances of Coppélia at the London Coliseum continue until March 18 — for details click here. Sleeping Beauty is a glorious union of music and dance with Tchaikovski’s score matched by Petipa’s choreography, and Peter Wright’s production for the Birmingham Royal Ballet does it full justice. The designs by Philip Prowse are excellent — the gold of the sets, and the black in some of the male costumes give a rich feel without the overwhelming pastel shades found in some other productions. The Prologue comes off very well, with the Lilac Fairy’s variation being taken by the sixth of six fairies, named here as Beauty, Honour, Modesty, Song, Temperament, and Joy. Their short tutus are all of similar colours, while the Lilac Fairy herself, gracefully portrayed by Andrea Tredinnick, is in a long tutu befitting a more calming and nurturing role. All the soloists did well, and Marion Tait as Carabosse was superbly musical as usual. Worth noting also that David Morse as Catalabutte, the master of ceremonies, showed fine stage presence and suitable angst, mortified by his omission of Carabosse from the guest list to the Christening. 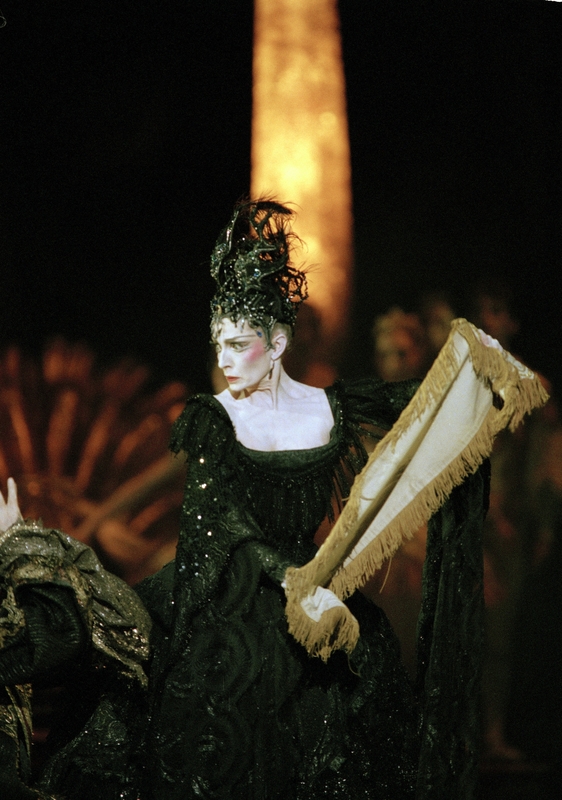 This production has some wonderful moments, and I particularly liked the way Carabosse reappears in Act I as a shrouded old woman, apparently willing to be arrested after giving Aurora the spindle, yet suddenly throwing off her disguise and creating havoc. Her disappearance in mid-air is very effective thanks to excellent lighting by Mark Jonathan. In fact the lighting was part of the glory of this production, giving a contrast between good and evil, particularly when both are on stage at the same time in the form of the Lilac Fairy and Carabosse. Also in Act I there was some slightly unfriendly competition between two of the four princes, played by Tyrone Singleton and Robert Parker, and it’s little vignettes like this that help to make the production come alive. Nao Sakuma danced well as Aurora, and was very hansomely partnered in the later acts by Iain Mackay. He did a fine job as her prince, stepping in for Chi Cao, who was unable to get back into the country due to the recent absence of air flights. It was the first time they had danced these roles together, and they did it perfectly. This is a company that obviously works well together, producing excellent soloists and a fine corps de ballet. In Act III, Mathias Dingman and Alexander Campbell were brilliantly matched in the pas-de-quatre, as were Carol-Anne Millar and Angela Paul, who showed magnificent sparkle. Joseph Caley and Momoko Hirata were excellent in the Bluebird pas-de-deux, and I loved Sonia Aguilar as the White Cat — she was utterly charming. If you want to see Sleeping Beauty, this production is terrific, and musically it was better than the recent run by the Royal Ballet. Paul Murphy conducted and drew exciting sounds from the orchestra, making the journey to the enchanted wood in Act II sound . . . well, enchanting. The choreography too, at that point, is delightful, and now includes the Awakening pas-de-deux. Performances continue until Saturday, 24th April.